You are currently browsing the tag archive for the ‘Thyme’ tag. Flavored simple syrups offer endless possibilities for drinks and gelatin molds. After enjoying the unique gelatinous merging of basil with blueberry lemonade and vodka and fig and cardamom cream with rum, I have continued to create various syrups with fresh herbs, spices, and dried fruits. 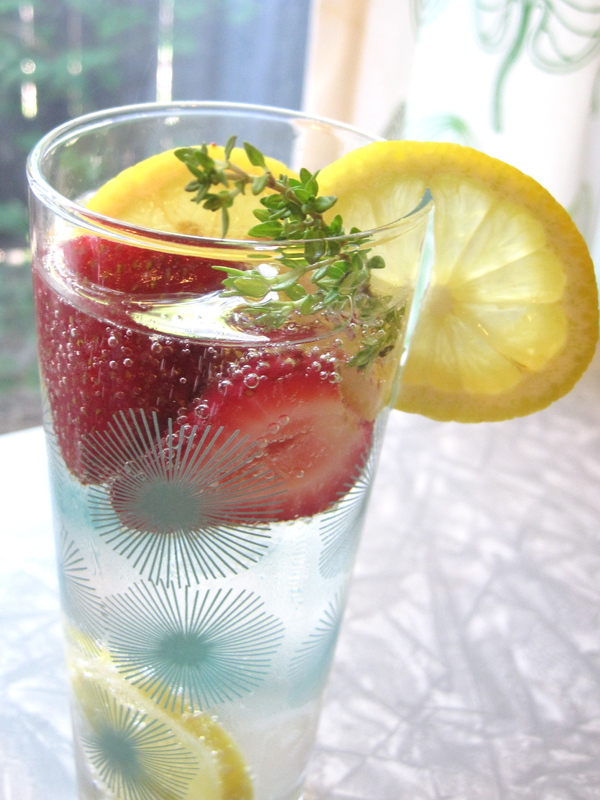 To experiment with flavor combinations, I paired the syrups with juices, fruits, teas, club soda, tonic water, and occasionally booze (see the lemonade with thyme and strawberries pictured below). In the midst of this enjoyable summer experimentation, a few combinations stood out as potential gelatin molds. (Yes, there are more herb-infused gelatins to come!) This gelatin mold consists of lemons, thyme, sugar, club soda, and vodka. A few of my friends winced at the mention of thyme in a gelatin mold, but after tasting they understood. The thyme compliments the lemons and vodka, while the sugar and club soda provide a sparkly sweetness.